Cedar Grove NJ Roofing Contractor: Do You Need to Repair or Replace Your Roof? - Tortorice Contractors Inc. Many homeowners start to worry when they see damp spots on their ceiling or when they find broken shingles on the ground after a storm. This is understandable because according to a Cedar Grove roofing contractor, repairing or replacing a roof can be very expensive. Sure, some roofing materials can last a long time, but sometimes wear and tear can shorten the lifespan of your house, especially your roof. Depending on the material your roof is made from, your roof can be damaged due to debris, wind, hail, and ice. There can also be structural issues with the vents. Flashing and the chimney can also damage the roof. 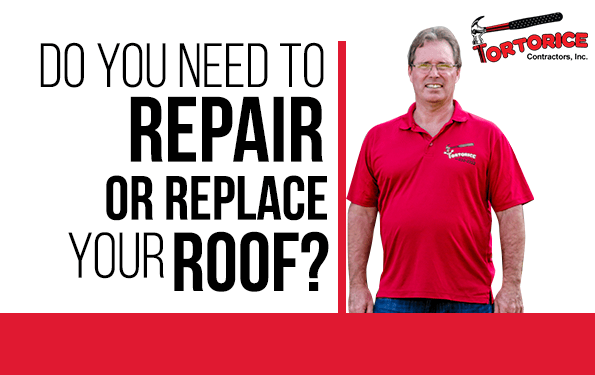 But when there is damage, how do you know whether it is time to repair or replace your roof? Here are a few tips to keep in mind. Cedar Grove roofing contractors always tell homeowners that their roofing system has a life expectancy. While regular repair and maintenance can extend its lifespan, roofs will eventually need replacing, especially if it is past its expected life expectancy. Asphalt shingles, for example, can last 20-30 years. If your roof is using this material and it has not reached the end of its life, call a Cedar Grove roofer for an inspection. The drips and wet spots might be due to missing shingles that you can easily replace or you can ask the roofer to perform repairs for you. Some materials, like slate, last a long time. Slate can last up to 100 years with proper repair and maintenance. However, if it is passed its age, your slate roof might need replacing. This is a common problem in old houses in cold climates. According to roofing companies from Cedar Grove NJ, age is not the only factor. The type of damage to your roof can also help determine whether repairs or replacement is needed. If you find one or two missing shingles, then a repair is what you need. However, a lot of missing shingles is more serious and can be a sign that you need to change your roof. If there’s damage like curling, buckling, or shingle granule loss, brace yourself for a probable roof replacement. Cedar Grove NJ roofers usually get a lot of calls during stormy times of the year. This is usually when water damage occurs. Yellowing ceilings, broken shingles, and dripping water are all signs of storm damage. Spring is also another busy time for roofers. Once the snow is starting to melt or slide down the roof, water damage can become more apparent. While it can be costly to repair or replace a roof after a storm it is actually a good time for you to do so. As the effects of climate change become more apparent, your first line of defense for your house is the roof. A sound and dependable roof is even more important as storms and snowfall become more severe over the years. According to roofers in Cedar Grove NJ, regular inspection and maintenance of your roof can help prevent damage after storms and heavy snowfall. Speaking of climate change, it can factor into your decision to replace or repair your roof. If you are finding that you frequently need to repair your roof, especially after rainfall, you might need a replacement. However, you also need to figure out your budget. If you can’t afford to replace your roof for the time being then a short term repair might hold it together until you can save up for a new roof. For instance, a roof patch is usually much cheaper compared to replacing a roof. However, if you need to patch a big section of your roof and you’re doing it more than once, replacing it might be more cost effective. Sometimes it is better to replace it and forget about it so you don’t have to worry about it for years to come. Sometimes the dripping water does not only damage your roof. This can also damage the interior of your house. The attic, for example, can see a lot of damage, especially if a lot of water was able to seep through. In cases like this, not only will you need to repair your roof but your attic and your insulation too. Most roofers in Cedar Grove NJ recommend that you consider replacing your roof to protect your family from the weather and also to preserve your attic and insulation. It is always best to call a Cedar Grove NJ roofing contractor for a complete assessment of the damage. Once their recommendations come through, review the estimate so that you can make an enlightened decision.